The Findhorn community is a well-known spiritual community in Scotland situated on a peninsula with, at its tip, the old village of Findhorn. The old village is actually the third village. The former two villages were further down the peninsula, and were swallowed up by the sea. Half way the peninsula lies the Findhorn community. It was established in 1962 by Peter and Eileen Caddy and Dorothy Maclean. Originally it was a dump site with a few caravans around it. Now it has grown in an extensive park with thousands of visitors every year. People from all over the world come here to stay or to visit. It is an excellent opportunity to meet spiritually oriented people. Everybody had his or her own story. You can meet the world in just a few weeks. When I visited the Community in 1983, I had many interesting conversations, and met some really special people. It was here in The Park, as they call the community, that I met Diane from Amsterdam, who was also visiting. One evening, we were talking in her cabin. It was dark outside and the bright lights of the Air Force base (just next to the Findhorn Community) in the distance were shining through the windows. She was heating up a kettle of water to make tea. Engaged in our conversation, we noticed too late that the water was boiling away and fogging up the windows. After pouring the tea, I noticed, looking through the fogged window that a strong wind was moving the mist outside past the windows from left to right. The shadows caused by the lights of the military base in the distance through the mist onto the windows could clearly be seen moving by at great speed. I pointed it out to Diane, when I suddenly realized that there was neither wind nor mist outside. We went outside and sure enough, no wind, no mist. We went back inside, and yes, we were still seeing those movements through the fogged up windows. I was perplexed. Diane, who is a psychic, went back outside and was feeling around. She explained to me that just next to the windows a ley line was running, and its energies were very active. Somehow, the fogged up windows combined with the lights, made these energies visible to us. We fogged up the windows again a couple of days later, but nothing showed. Diane was feeling around again, and said that the ley line was quiet. Ley lines are not always active. They wax and wane. Some people say that there is a connection with the moon, but other cycles may be involved too. Many megalithic stones, are placed on ley lines in order to access the earth’s energies. Europe is filled with stone circles, dolmen, menhirs, barrows. 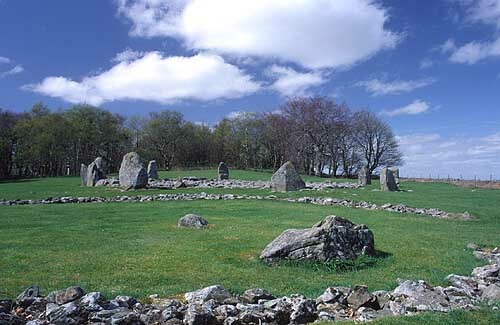 Studies have shown that the stone circles were all built based on a universal unit, called the megalithic yard. Most of them have clear astronomical purposes. At the same they were built on energy spots, so they could be used for religious ceremonies and healing purposes. During my stay at the Findhorn community, a day trip to several stone circles and solitary stones in the area was organized. In contrast to Belgium, where most of the megalithic sites have disappeared by the hand of humans who did not care for them anymore, in Great Britain all these sites are protected and maintained by the state. We went to some great sites where all the stones were still intact. The energies in those places are still strong. We went to a large stone circle (Loanhead of Daviot stone circle at Aberdeenshire, Scotland) that, oddly enough, was filled up with sharp little stones, with two smaller circles nearby. I went to sit on a small flat stone outside the large circle, in order to look at the entire complex. After about a minute I became so restless and annoyed, I just had to get up and walk around. When we were back in the van, I told Diane about my strange feeling. Another person who overheard us, said that he also sat on the same stone and had felt the same irresistible urge to get up. Diane replied that it was the work of the nature spirits who still take care of that spot. She had clearly felt them, and that they did not like people coming over and sitting on the stones. The next stone circle we visited had a lovely energy around it. Among the six-foot stones were a couple of one to two foot stones. I had never seen stones that small in a megalithic circle. When I was feeling the stones, I got the impression that the circle had been used by both humans and Little People, a kind of dwarf race that does not reside on the Earth’s surface anymore. They had used the little stones in the circle. One of the larger stones had a heart shape, the size of hand, cut out. Some people in our group, when putting their hand on this heart, felt a pulsating energy, like the beating of a heart. We went to a place called Turtle Hill, because the megalithic stones on top the hill were laid out in such a manner that they looked like a turtle from a distance. Two separate menhirs guarded the turtle. I stood with my back to one of them facing the strong wind blowing up the hill. I was just relaxing and enjoying the wind, when I felt a strong pressure between my eyebrows, where the Ajna chakra is located. I had never felt anything like that. I wished I had more time to explore these sites. This entry was posted in earth energies, ley lines, megaliths, nature spirits and tagged dolmen, earth, energies, energy, experiences, Findhorn, Ley line, Megalith, megalithic, menhir, Scotland, spiritual, stone, Stone circle, stones. Bookmark the permalink.